Accusations of sexual assault have been prevalent for the news over the past few years. Recently, an accusation about Judge Brett Kavanaugh made headlines as he was in the process of being confirmed to the Supreme Court. The country sat on edge wondering whether or not he would be confirmed and what his confirmation (or lack thereof) said about American values. It appears that many Americans are no longer upset about sexual assaults. This was shown by the election of President Trump and then the confirmation of Brett Kavanaugh. It is time that we stop condoning sexual assault and giving offenders power. The testimonies of Dr. Christine Blasey Ford and Mr. Kavanaugh were highly analyzed in the media and were the hot topic of discussion in the news. The small details were scrutinized regarding both the senate judiciary committee and the people testifying. This article from Time Magazine discusses how the female Democratic senators were not being allowed to speak to Mr. Kavanaugh. The decision as to who gets to speak lies with Senator Chuck Grassley, the chairman of the senate judiciary committee. One example of this is, “Women Senators spoke out of turn: “Mr. Chairman, I’d like to be recognized,” pleaded Democrat Kamala Harris of California, to no avail.” The Chairman refusing to recognize the female Senators is a big problem. Sexual assault is something that directly involves women and to not allow women to speak about it only perpetuates the issues. After the confirmation of Kavanaugh to the Supreme Court, 302 women were held by the police for protesting the confirmation at a Senate Office Building. They were arrested because it was deemed that they were “unlawfully demonstrating.” Women proved that they could not be shut down. The sadness and anger that many women were feeling bubbled over into rage once the committee voted on his confirmation. Many women have to face the fact that politicians are telling us that they don’t care about us. That is scary to hear as a young woman. It is scary to know that we live in a world where our safety isn’t as important as power. Sexual Assault and the Supreme Court by Maggie is licensed under a Creative Commons Attribution-ShareAlike 4.0 International License. Maggie, I really enjoyed this post. I did not know that so many women were held by police for protesting. I particularly liked when you said, “It is time that we stop condoning sexual assault and giving offenders power.” This was a powerful line because it plays into the frustration that many people are feeling right now about Kavanaugh’s Supreme Court confirmation. 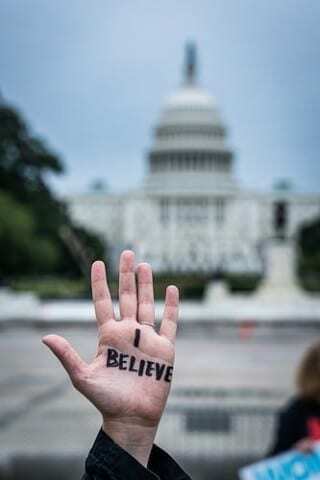 I would love to know what you would say to people who argue that there was not enough evidence to prove that Mr. Kavanaugh assaulted Dr. Christine Blasey Ford. You may find this Atlantic article about why Susan Collins voted to confirm Kavanaugh interesting: https://www.theatlantic.com/politics/archive/2018/10/susan-collinss-kavanaugh-sexual-assault/572347/. Maggie, this is a great essay! Your writing is very compelling and I really enjoyed reading this. I can relate to this because I am also very upset about how Americans are desensitized to sexual assault and I wrote about the upsetting confirmation of Mr. Kavanaugh in my Sociobiography. I thought it was very interesting that the female Democratic senators were not allowed to talk to Mr. Kavanaugh. I had no idea about this and this makes the situation more upsetting. In conjunction with your statements about the arrests, I found this interesting article by The Washington Post about how 128 people were arrested after a anti-Kavanaugh protest. I look forward to reading more of your writing in the future!